What is a Flashover and how does it occurs? 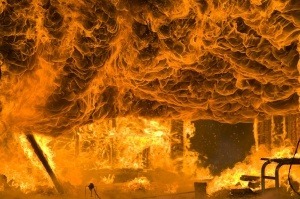 A flashover is the near-simultaneous ignition of most of the directly exposed combustible material in an enclosed area. When certain organic materials are heated, they undergo thermal decomposition and release flammable gases. Flashover occurs when the majority of the exposed surfaces in a space are heated to their autoignition temperature and emit flammable gases (see also flash point). Flashover normally occurs at 500 °C (932 °F) or 590 °C (1,100 °F) for ordinary combustibles, and an incident heat flux at floor level of 20 kilowatts per square metre (2.5 hp/sq ft). An example of flashover is ignition of a piece of furniture in a domestic room. The fire involving the initial piece of furniture can produce a layer of hot smoke which spreads across the ceiling in the room. The hot buoyant smoke layer grows in depth, as it is bounded by the walls of the room. The radiated heat from this layer heats the surfaces of the directly exposed combustible materials in the room, causing them to give off flammable gases via pyrolysis. When the temperatures of the evolved gases become high enough, these gases will ignite, throughout their extent. The following are some of the signs that firefighters are looking for when they attempt to determine whether a flashover is likely to occur. – The fire is in a ventilated compartment, so there is no shortage of oxygen in the room. – The neutral plane is moving down towards the floor. In this situation, a flashover is plausible. – All directly exposed combustible materials are showing signs of pyrolysis. “Rollover” or tongues of fire appear (known as “Angel Fingers” to firefighters). – There is a rapid buildup of heat given off by the rapidly burning (i.e., deflagrating) gases. This is generally the best indication of a flashover. – Firefighters memorize a chant to help remember these during training: “Thick dark smoke, high heat, rollover, free burning. The colour of the smoke is often considered, as well, but there is no connection between the colour of the smoke and the risk of flashovers. Traditionally, black, dense smoke was considered particularly dangerous, but history shows this to be an unreliable indicator. For example, there was a fire in a rubber mattress factory in London in 1975 which produced white smoke. The white smoke wasn’t considered dangerous, so firefighters decided to ventilate, which caused a smoke explosion and killed two firefighters. The white smoke from the pyrolysis of the rubber turned out to be extremely flammable.